Plywood Sheets - Marine Plywood, Birch Plywood, Shuttering Plywood : Massive choice. 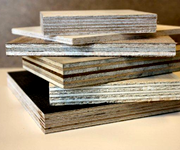 Plywood (Melamine Faced, Smooth Phenolic Resin, Anti Slip Finish, Film Faced or Special Paper Finishes). Plywood is available in very wide choice of types and sizes. Birch Plywood, Marine Plywood, Shuttering Plywood, Roofing and Flooring Plywood are just a few of the many types available. Avon Plywood Ltd, as the name suggests are recognised plywood specialist, and are able to offer a wide choice of plywood types and grades from an extensive range held in stock. We are located in Keynsham near Bristol in the South West of the UK. Orders may be collected or can deliver on own vehicles, via Courier Service or Haulage Contractor throughout the UK. As established suppliers to trade and retail customers we specialize in fast, accurate cutting to size of panels all at competitive prices. Selecting plywood panels from our large range "in store" means that lead times are short from initial enquiry to completion of orders. In addition, special order, non-standard specification plywood can be sourced to order. The majority of these stock items are glued with an Exterior WBP (Weather and Boil Proof) quality glue exceptions being MR (Moisture Resistant) grade glued Fire Resistant Plywood, Poplar Plywood & Laser Quality Birch Plywood. Most items are now sourced from FSC ® (Forestry Stewardship Council) or PEFC (Program for the Endorsement of Forest Certification) accredited suppliers. Plywood : Types, Sizes & Thicknesses. The convention to indicate grain direction is used whereby the first dimension shown is the direction of the surface veneer grain. i.e. 2440mm x 1220mm is Long Grained and 1220mm x 2440mm is Cross or Short Grained. 2440mm x 1220mm x 4mm, 6mm, 9mm, 12mm, 15mm, 18mm & 24mm. 1220mm x 2440mm x 4mm, 6mm, 9mm, 12mm, 15mm, 18mm & 24mm. 1525mm x 3050mm x 4mm, 6mm, 9mm, 12mm, 15mm, 18mm & 24mm. 1525mm x 1525mm x 4mm & 6mm. 2440mm x 1220mm x 4mm, 5.5mm, 9mm, 12mm, 15mm, 18mm & 25mm. 2440mm x 1220mm x 3.6mm, 5.5mm, 9mm, 12mm, 15mm, 18mm, 22mm & 25mm. 3050mm x 1220mm x 4mm, 6mm, 9mm, 12mm, 15mm, 18mm & 25mm. 3050mm x 1525mm x 4mm, 6mm, 9mm, 12mm, 15mm, 18mm & 25mm.